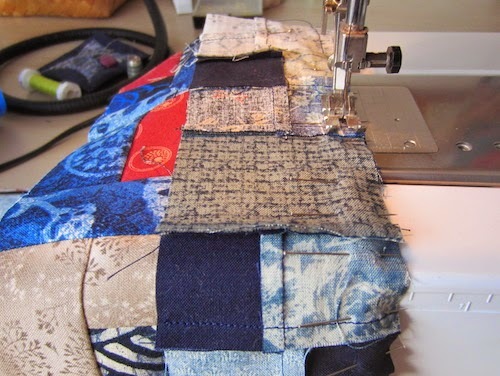 I've been playing with my Japanese fabric scraps again and completely enjoying it. Another Colorplay scrap quilt is almost finished. It's the chartreuse one. I'm almost finished sewing the binding on. I'll take a picture of the whole quilt when it's done. 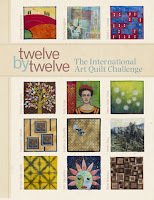 There are two more Colorplay scrap quilts waiting to be quilted. And also two completed quilts waiting to be put away somewhere, or maybe displayed on a wall, I haven't decided yet. Next are two pictures taken a few days ago during a walk along the river Lesse. There is a kayak on the first one. I did this river descent when I was 30 years younger... 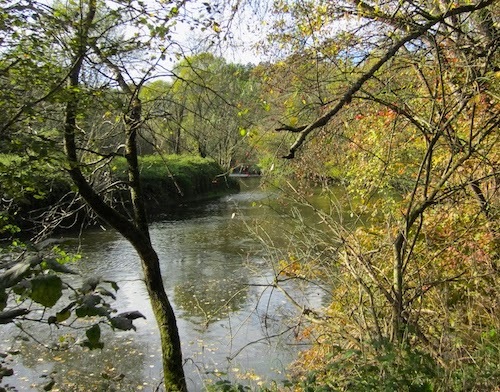 It looks very peaceful here, but a few miles further, it gets a bit wilder. I remember we had lots of fun. The next photo is Dinant. Can you see the big colorful saxophones on the bridge? 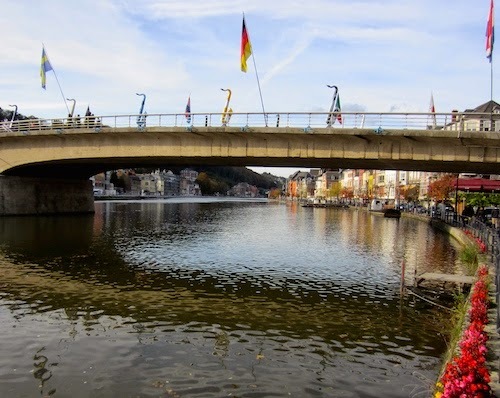 Did you know that Adolphe Sax was born in Dinant exactly 200 years ago? Many concerts and exhibitions in his honour are currently organized in Belgium. 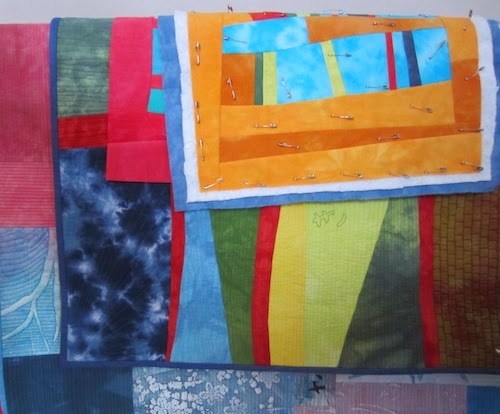 Wonderful bright colours in your quilts, Francoise, it's always a treat to see your work. It looks like beautiful countryside where you went for your walk, the weather's been amazingly good lately in the UK, you must be getting some sun too. 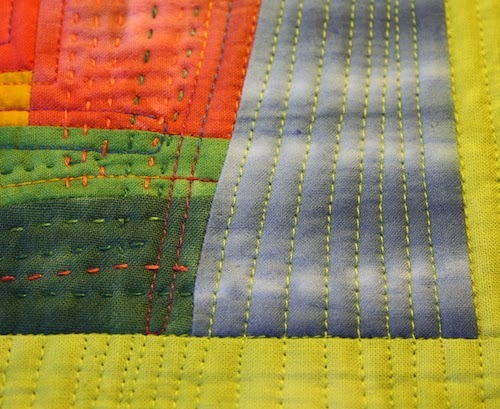 I love the quilts and the combination of machine/hand quilting in bright colors! 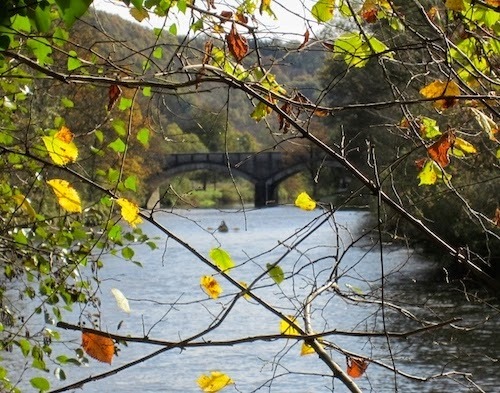 I can see why you'd enjoy paddling that river, it looks so scenic and rather peaceful (until you hit the rapids, I'm sure).